Play with a balloon! Here is a link to 11 fun balloon games. Make sock puppets! Here is a link to crafting a super sock friend. Eat ice cream cones! You’ll understand why after the last page. My deepest thanks to illustrator Scott Magoon who sent me this book after I entered his giveaway for subscribers to The Magoon Tribune. Kudos on the endpapers Scott – a really nice touch! 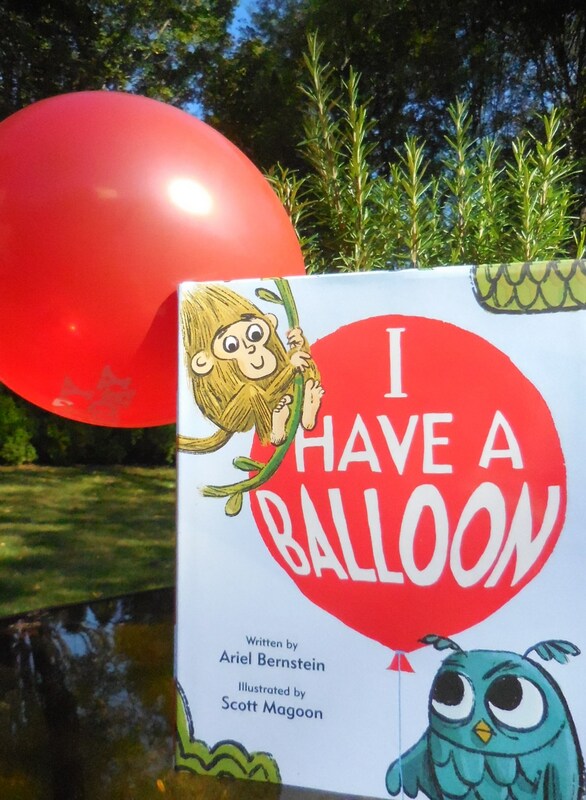 This entry was posted in Uncategorized and tagged Ariel Bernstein, balloon, Perfect Picture Book Friday, Scott Magoon, sharing, sock, Susanna Leonard Hill. Bookmark the permalink. Balls are so much better for playing fetch with Becca! ❤ Happy Friday Maria! Great premise! Can’t wait to see it! This really finds the PreK – K sweet spot for the littlest PB fans. Enjoy! Oo, I love it when there is a shout out to end papers. It sounds a little like an Elephant and Piggy story. I am so looking forward to reading this book. Huge congrats to Ariel and Scott! The book sounds beyond adorable. Clever and spot-on for the sharing-set indeed. I hope you love it! Oh, a book about sharing. My great grandson is in that stage of not wanting to share. Gave him “Mine!” and it’s his favorite book. Know he love book too — great use of humor. This would be a great book to add if he ever tires of “Mine!” 🙂 Such a “fun” age, right? Arrr this is a great book. Came across it last week. I loved the expressions in this. Whooo knew an owl had so many expressions, right? 😉 I am so glad this book has reached your shores already Diane! I absolutely adore this book! It has a droll, deadpan humor that I just love. I need to go write a review of it myself. Love your feature of it! Nice when the book is rich for the reader / parent as well as the child. I agree – has just the right amount of deadpan humor to make the story sing! Oh, this sounds hilarious! It’s now on my TBR list. Thanks! It’s a fun one Jilanne – hope you ejoy it! Thanks for stopping by! Cathy, this strikes such a universal chord. It takes quite a while before the -“If I have it – it’s mine, if I had it – it’s mine, If I see it – it’s mine, and of course it you have it – it’s mine,” grasp of reality changes. What a great book. Thanks. Yes! You understand well the toddler mindset of ownership! Perhaps the sequel will reveal what happens next. Thanks for stopping by Maria! oooh! a Sock! Well, I am certainly going to have to read this one! A special sock…it has a hole! LOL Love your enthusiasm Sue! This sounds great! There can’t be too many books about sharing and this one looks funny! I agree – humor goes a long way in getting a message across. Will Owl and Monkey discover that sharing is more fun? We will have to stay tuned! Thanks Andrea.